Twenty years ago, Turow made waves with the book and film for the tight mystery of “Presumed Innocent.” In Alan Pakula’s film, Harrison Ford memorably played Rusty Sabich, a prosecutor who watched his life turn upside down after his mistress ended up dead. Two decades later, Ford has been replaced by Bill Pullman but poor now-Judge Sabich is in hot water again after his wife (Marcia Gay Harden) ends up dead. Why did Sabich wait a day after she died to report it? Was it to let the poison leave her system? As it did twenty years ago, infidelity plays a major role in the life of Sabich — one could easily read these as moral tales on Turow’s part…fool around and somebody’s gonna die. This time he sleeps with a gorgeous law clerk named Anna (Mariana Klaveno of “True Blood”) a year before his wife’s death. It’s also seen in flashback that Rusty had a contentious relationship with his bipolar spouse and his son Nat (Callard Harris) plays a major part in the mystery, even if it’s mostly just to have someone to explain it all to in the final scene. Richard Schiff delivers the most interesting performance in the piece as Tommy Molto, the prosecutor who feels like Sabich got away with murder years ago and might do it again now. Tahmoh Penikett is also effective as his over-eager assistant. This is generic legal plotting of the most cliched variety. The legal issues are ridiculous and ring false. The character motivations are paper-thin and over-explained. And even the mystery isn’t that interesting. One could never in a million years figure out the exact reason that Rusty’s wife ended up dead that night, so there’s no mystery to solve. And Rusty’s actions after her death make no sense even after he explains them. It’s the kind of telefilm where the behavior of the characters only adds up in the sense that it serves the plot, not in a way that resembles real life in any way. There’s literally a scene where one character basically lays out what happened with a major plot twist for five minutes. “Here’s what happened dummies.” And then it happens again fifteen minutes later. Turow has always been a strong writer, the kind of scribe who can get pages turning, but this is not his best storytelling and it’s made weaker by writer/director Mike Robe’s reliance on cliche and complete and utter lack of subtlety. It doesn’t help that Pullman, an actor I’ve liked before, is woefully miscast here. He looks bored. You will be too. 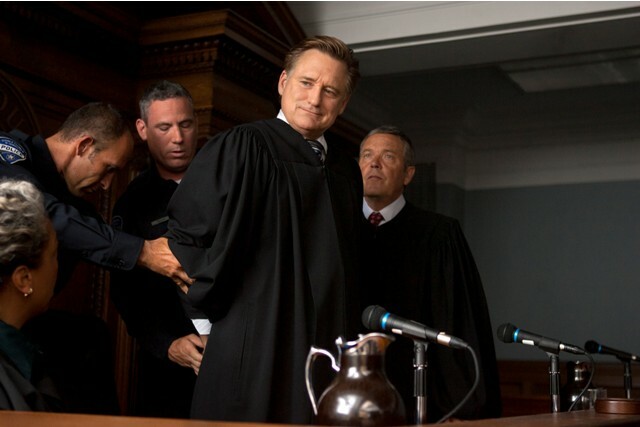 “Scott Turow’s Innocent” stars Bill Pullman, Marcia Gay Harden, Alfred Molina, Richard Schiff, Callard Harris, Mariana Klaveno, and Tahmoh Penikett. It was written and directed by Mike Robe and premieres on TNT on Tuesday, November 29th, 2011 at 8pm CST.